Michigan Rep. Justin Amash said he and his conservative colleagues wanted a full-blown departure from the Obama law, rather than what Speaker Paul Ryan, R-Wis., was offering, but were given little voice. “From the beginning of the process, I think the way it was set up did not bring the disparate parts of the conference together,” Amash said. New York Rep. Chris Collins, an early Trump backer in the campaign, echoed the bill’s supporters in chiding opponents for not seizing the opportunity to deliver on the perennial campaign promise. “I can tell you right now there’s bitterness within our conference, it’s going to take time to heal that,” Collins said. Ryan pledged the House would return to its campaign agenda, including legislation aimed at beefing up U.S.-Mexican border security, increasing spending on the military and public works, while also reining in the budget deficit. The GOP has to move beyond the defeat, with midterm elections next year and the historic disadvantage the president’s party typically faces in holding seats. 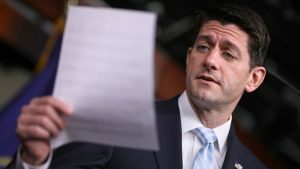 Ryan’s toughest opponents were the 30 or so members of the House Freedom Caucus, the hardliners widely expected to be marginalized after Trump won, but instead a bloc that showed its strength. The GOP owes its majority numbers to the brand of conservatism born in opposition to the 2010 health care law, the tea partyers and non-conformists like Sens. Rand Paul of Kentucky and Ted Cruz of Texas. After all that winning, former Republican National Committee Chairman Haley Barbour cast the GOP as an expansive party with multiple factions. But the former Mississippi governor said Republicans must produce something for the electorate because they “have told the American people from Day One” they would. For his part, Ryan insisted there is a viable governing path. Beaumont reported from Des Moines, Iowa, and Barrow from Atlanta. Associated Press writers Kevin Freking and Mary Clare Jalonick in Washington contributed to this report.